Ever wondered what truly causes those unattractive broken facial capillaries around your nose and cheeks and how to get rid of them? Well, there are multiple underlying culprits for broken capillaries on face. Our face is almost never covered and gets exposed to all weather elements like sun, heat, harsh winds and cold, all these factors undoubtedly affect the condition of our skin. As we become older, our skin loses its elasticity and can no longer properly support the tiny blood vessels that lie very closely to the surface of the skin making them more susceptible to ruptures. Sun damage is another important factor contributing to the broken capillaries on the nose by damaging delicate facial skin. Once the skin is exposed to large doses to UV radiation, the upper layers of skin get inflamed and respond by broken facial capillaries and brown pigmentation spots. Some blood thinning medications can make you more prone to broken facial capillaries and overall easier bruising all over your body as your blood does not coagulate as well. Prescription corticosteroid ointments for the treatment of eczema or rosacea can make your skin much thinner and more fragile adding to your broken facial capillaries causes. 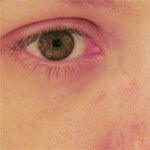 Your blood capillaries can burst not only on the face but also in the eyes. Blood vessel burst in eye is mostly associated with a foreign body presence, trauma to the eyes or an eye infection. In addition, you can get blood vessel burst in eye after an especially strenuous activity like heavy lifting, constipation, coughing; a lot of women get them in labor while trying to push the baby out. So, is there anything you can do for thread vein removal? Yes, there are currently two leading dermatological procedures for the removal of broken facial capillaries like photo facial skin rejuvenation that works by implementing intense pulse light to remove broken facial capillaries and laser thread vein removal therapy. Since sun damage is the leading factor in broken facial capillaries, pay special care to protect face by applying sunscreen all over your face and wearing a wide brim hat to protect skin from further aging.